Published on April 18, 2010 in COP, Elections, General T&T, NJAC, People's Partnership, PNM, Politics and UNC. 15 Comments Tags: Calypso, Jack Warner, Kamla Persad-Bissessar, NJAC, Patrick Manning, Politics, T&T Govt, Winston Dookeran. 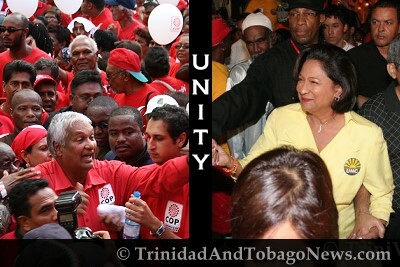 It is final – Trinidad and Tobago’s leading opposition parties and some trade unionists have agreed to unite and contest the May 24 general election under a single banner. IN her first official speech following the announcement of an election date, Opposition Leader Kamla Persad-Bissessar on Friday vowed to focus on the issues of work and family life affecting local women. Published on April 18, 2010 in COP, Elections, General T&T, NJAC, People's Partnership, PNM and UNC. 5 Comments Tags: Patrick Manning, Politics, Raffique Shah, T&T Govt, UNC, Unity. I DON’T know if the two main opposition parties in Trinidad, Tobago’s TOP, and the trade unions and NGOs, will forge an alliance that is attractive to the electorate. As I write this column, top officials from the United National Congress (UNC) and the Congress of the People (COP) have held several meetings.